With the Park City Socks off the needles, I'm now onto the next unfinished sock in the WIPs pile. I'm sure a few of you have already seen progress photos of this project if you follow me on Twitter, Facebook, or Instagram. But here it is for those of you who haven't seen it yet. Yes, it's another pair of Skews! This time, I'm going to attempt to knit them into knee highs. I'm using yarn that's been in the stash for years now (yay!!) and have always wanted to use, but for some reason just never did. As you can see in the photo above, it's a Zauberball in the Frische Frische colourway (mmm...I love me some rainbow yarn!) mixed with some natural, undyed yarn that I had gotten from my friend Ursa when I had attended her dye day last summer. 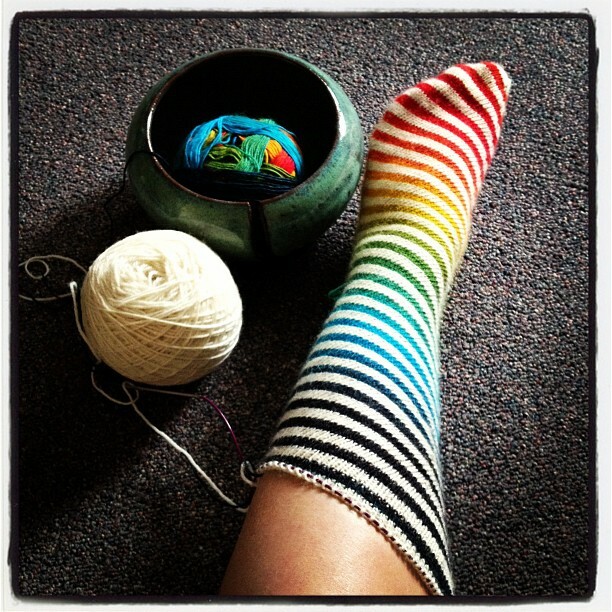 I knew that I wasn't going to get a pair of knee high socks with just the Zauberball, and after scrolling through Ravelry I got the inspiration to use another yarn to supplement the rainbow yarn of goodness. So far I'm loving what I'm getting and I forgot just how much fun this pattern is to knit. Although I'm sure there are a few knitters out there that will disagree (ahemMAEahem). I will admit that after the main instructions, I have absolutely NO idea what I'm doing when it comes to the calf area. I guess I should've knit up a pair of simple knee socks before tackling this project, but where's the fun in that? I've checked out other knee high Skew projects on Ravelry to see what other knitters have done, and while they were helpful, they were more of a guideline. So I'm kinda left to my own devices here. That's ok, it's all about the learning. Right? I'm currently on the first sock. 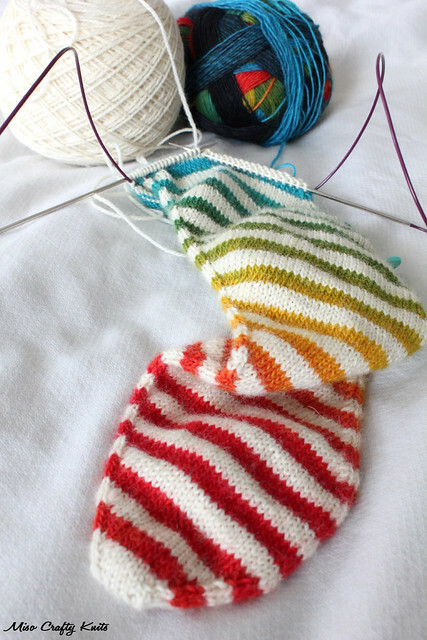 Usually with this pattern I will start both socks on separate circulars, but this time around I decided to start out with the one sock to see how it goes. But I'm really stalling on the calf here and have already tinked back a few times and am contemplating ripping back to the ankle cause I'm not liking how I'm increasing or the look of the sock when it's on. Grrrr for having such meaty calves!! So I'm tempted to re-skein my ball of yarn just so that I can get the second sock started. Now, for a ball of yarn to claim that it's a center-pull ball, finding the end is next to impossible!! Oh, and another thing I'm contemplating - the cuff. I don't want to continue the striping on the cuff as I'm not really crazy with how it would look. I'm thinking a solid colour cuff would make me one happy knee high wearing sock knitter. I'm really leaning towards using the natural yarn for the cuff, but am wondering if I'll have a ton of the Zauberball leftover that I should just use that up instead? Decisions, decisions! What do you think? Natural or rainbow? Until I can figure out what I'm doing for the calves, don't expect to see these socks finished any time soon. I reckon you won't be seeing them again until at least the summer...for now I've got to get a few cardigans off the needles and oooohhh...some secret knitting...shhh!!! I'm really hoping to be able to get some knitting accomplished this weekend. Brett has plans to go crab fishing again and I'm making it my mission to drastically reduce my computer and internet usage to spend some more time with the Munchkin. Yes, I know...as a stay at home mom, how much more time can you spend with the kidlet? Well I've made the realization that my crafting and housework can always wait a little but my son won't be a kid forever. Since Brett and I haven't made the decision yet as to whether or not we'll be having another kiddo, I'm going to enjoy these younger years while I can. That's not to say I won't be knitting at all throughout the day, I can usually squeeze in some knitting time here and there but for a while there I was constantly telling the Munchkin "just one more row"...I have plenty of time to do my thing when he goes to bed. But after seeing how much happier and calmer the Munchkin was after I tried out my computer/internet cut-down yesterday, I'm going to do it again this weekend. So I'll forewarn you now that you might not hear from me until Monday or Tuesday if you leave a comment or send me an email or PM. I hope you'll all be able to head outside this weekend too and get some fresh air and catch some rays!! Ok, maybe not so much sun for those of you who are in Calgary and are still dealing with the current dump of snow! I, too, have thick calves, and had to fight with calf shaping on a pair of simple stockinette socks I am knitting (sporadically; plain stockinette is boring the crap out of me). I feel your pain! Hot damn I love these socks! Do it! We can be twinsies! ;) I don't know what it is, but rainbow Zauberball = smiles and happiness to me! These look awesome!!! I would knit the cuff in the natural colour. I think that would look nicer than the rainbow. I have never knit socks before. I really should give it a go. I am a lurker, but I actually exclaimed out loud at your socks, so I had to comment. They are glorious! I vote for a natural cuff. I was already on the side for the natural cuff, but now, with so many votes for it, that's the game plan. Yay for rainbow socks!